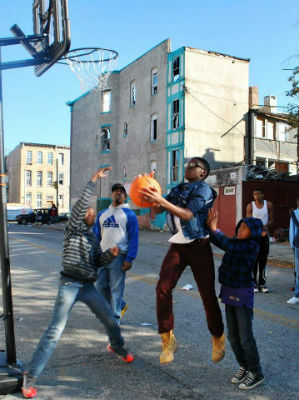 Photo: A game of basketball in the Franklin Square neighborhood. West Baltimore—one of the lowest socioeconomic areas in the state of Maryland. Over 84 percent of Baltimore city residents qualify for free or reduced lunches. This area is also close to the violence and unrest that made headlines in 2015. All of these hardships from the past continue to affect residents in the present, but there is a resiliency that is carrying the community to a brighter future. In January 2016, the nonprofit community development corporation, known as Operation Win in Life CDC, was launched. This program came from a dire urge to fight back against past struggles and enhance the quality of living for the people in West Baltimore, focusing specifically on the square block area surrounding Celebration Church at Monroe Street. 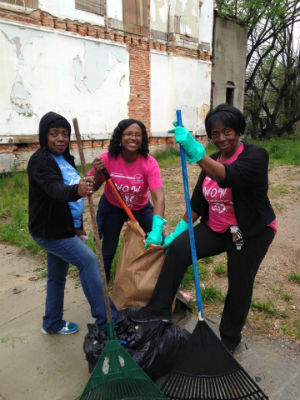 Photo: Celebration Church’s neighborhood cleanup. Celebration Church is one partner in Operation Win in Life because of the long and positive relationships the congregation has maintained with both local residents and elected officials. This partnership will give the church greater opportunities to serve the people around them. Just a few examples of how Celebration Church has already supported the community are the regular church services, bible studies, youth and children activities, marriage ministries, and outreach events. Typical outreach events that the church organizes are the fall festival, community service days, the Better You conference, and the Gospel Jazz Café. Other partners involved in Operation Win in Life CDC are residents, elected officials, businesses, public agencies, nonprofit organizations, and faith-based organizations. All of them are planning how they can help West Baltimore build a bright and positive future. Meetings with Morgan State University, a Baltimore-based university, have already taken place to gain more opinions on how to encourage the community. They are currently seeking a planning grant to continue the collaborative process. 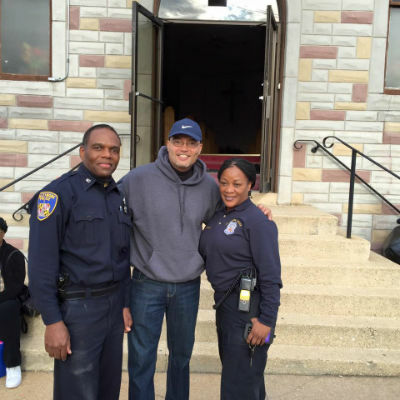 Photo: Pastor Bob with police officers at the church’s Health Fair & Harvest Festival. Another large partner in Operation Win in Life is the Southwest Partnership in West Baltimore. They are working to engage a private developer to purchase empty buildings and lots in the square block of Saratoga, Monroe, Mulberry, and Fulton as a way to provide stability to the northwest corner of the Franklin Square neighborhood. The goal is to renovate and sell the empty houses and turn the lots into creative centers for community improvement. This could mean anything from playgrounds, green space, or gardens that will bring life to the community and prevent illegal dumping. The due diligence team is researching ways that after-school and summer activities can be provided for children and youth, as well as opportunities to host workshops for the community to teach about entrepreneurship, job readiness, and relationship skills. There was already a conference hosted in July 2016 to train community members in these kinds of life skills. Operation Win in Life CDC is still in its early stages of development, but the reclamation work they have done so far is already proving to the community and to the nation that residents of Baltimore can and will win in life. Emily Ploetz is a communication intern for Church of God Ministries from Cincinnati, Ohio. She is currently studying English education at Anderson University. Were you blessed by reading this story? Support the ongoing work of Church of God Ministries with your gift to the World Ministry Fund at http://www.jesusisthesubject.org/world-ministry-fund/. This entry was posted in All Church of God, Northeast and tagged Baltimore, Bob Washington, Celebration Church at Monroe Street, city ministry, community development corporation, Emily Ploetz, Maryland, Operation Win in Life, reclaim your neighborhood, reclamation, urban ministry. Bookmark the permalink.